The Shabbat morning service is called Shacharit Shabbat. 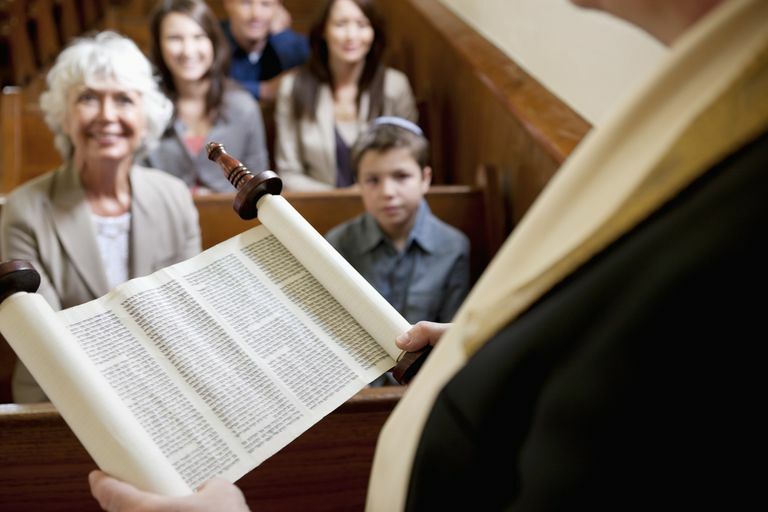 While there are many differences in the customs of different congregations and denominations of Judaism, every synagogue’s service follows roughly the same structure. Shabbat morning services begin with the Birchot Hashachar (morning blessings) and P’sukei D’Zimra (Verses of Song). Both Birchot HaShachar and P’Sukei D’Zimra are structured to help the worshipper enter into the proper reflective and contemplative state of mind before the main service begins. The Birchot HaShachar originally began as the blessings people would recite each morning in their home as they awoke, got dressed, washed, etc. Over time these shifted from the home to the synagogue service. The actual blessings recited in each synagogue will vary but they generally include such items as praising God for allowing roosters to differentiate night and day (waking us up), for clothing the naked (getting dressed), for giving sight to the blind (opening our eyes in the morning), and for straightening the bent (getting out of bed). Birchot HaShachar also thanks God for our bodies functioning properly and for the creation of our souls. Depending on the congregation there may be other biblical passages or prayers said during Birchot HaShachar. The P’Sukei D’Zimra portion of the Shabbat morning service is longer than the Birchot HaShachar and contains numerous readings, primarily from the book of Psalms and other sections of the TaNaCh (Hebrew bible). As with the Birchot HaShachar the actual readings will vary from synagogue to synagogue but there are many elements that are included universally. P’Sukei D’Zimra begins with a blessing called Baruch Sheamar, which lists many of the different aspects of God (as Creator, Redeemer, etc.). The core of P’Sukei D’Zimra is the Ashrei (Psalm 145) and Hallel (Psalms 146-150). P’Sukei D’Zimra concludes with the blessing called Yishtabach which focuses on praise of God. The Shema and its surrounding blessings are one of the two main sections of the Shabbat morning prayer service. The Shema itself is one of the core prayers of Judaism containing the central monotheistic assertion of the Jewish faith. This section of the service begins with the call to worship (Barchu). The Shema is then preceded by two blessings, Yotzer Or which focuses on praising God for creation and Ahava Rabbah which focuses on praising God for revelation. The Shema itself consists of three biblical passages, Deuteronomy 6:4-9, Deuteronomy 11:13-21, and Numbers 15:37-41. After the recital of the Shema this section of the service concludes with a third blessing called Emet V’Yatziv which focuses on praising God for redemption. The second main section of the Shabbat morning prayer service is the Amidah or Shmoneh Esrei. The Shabbat Amidah consists of three different sections beginning with praise of God, leading into the middle section that celebrates the holiness and specialness of Shabbat, and concludes with prayers of thanksgiving and peace. During the regular weekday service, the middle section of the Amidah contains petitions for individual needs like health and prosperity and national aspirations like justice. On Shabbat, these petitions are replaced by a focus on Shabbat so as not to distract the worshipper from the holiness of the day with requests for worldly needs. Following the Amidah is the Torah service during which the Torah scroll is removed from the ark and the weekly Torah portion is read (the length of the reading will vary depending on the congregations custom and the Torah cycle being used). After the Torah reading comes the Haftarah reading associated with the weekly Torah portion. Once all readings are completed the Torah scroll will be returned to the ark. After the Torah and Haftarah readings, the service concludes with the Aleinu prayer and any other concluding prayers (which again will vary depending on the congregation). Aleinu focuses on the Jewish obligation to praise God and the hope that one day all of mankind will be united in service to God. What Is the Maariv Service in Judaism? How Are Tefillin Used in Jewish Prayer? What is the Mourner's Kaddish in Judaism? What is the Shema in Judaism? What Is Yizkor and Why Do Jews Say It? What Is the Religious Purpose of a Bracha in Judaism? Simchat Torah—the Holiday With Lots of Liquor! What is a chumash? How does it differ from a Torah scroll?